So you want to start an online business but aren’t sure where to begin. Of course there’s tons of options out there, right? There’s eBay and Etsy, blogging and Bitcoin. And of course, my favorite, Amazon. Yet, for new and aspiring entrepreneurs, setting up an online business can be intimidating. That’s why I wanted to take a little time to break down the process of creating an Amazon business. This guide will cover the basics of Amazon as well as show you how to navigate Amazon seller registration. I’ve broken it down in four parts. First, I’ll cover the basics of starting an Amazon business. Don’t let the word “business” make you think that you have to go all out and set up a corporation. An Amazon business can be as big or as basic as you want it to be. Next, I talk about what it costs to sell on Amazon. I think you’ll find it’s actually pretty inexpensive, especially if you compare it to the tens of thousands you’ll need for a brick and mortar store. After that, I’ll walk you through the steps of Amazon seller registration and creating an account on Amazon. Finally, I’ll review a few more of the basics of Amazon selling. Before I jump in, if you’re already pretty smart about Amazon stuff, you might take the time to tune into our free Amazon Selling course. It’s a short video, just 45 minutes, and it walks you through all of the steps for finding and launching a product. Just click on the button below! What’s great about Amazon, is that there’s no one way to start an Amazon business. Even though it’s been over five years since I went through the Amazon seller registration process, I keep learning cool new ways to do it. The one thing that I can’t express enough, though is how simple it is to sell on Amazon. How to start an Amazon business in 3 easy steps. Choose what you plan to sell. You don’t have to go nuts and start your own private label (although, I highly recommend it once you’re comfortable selling on Amazon). A lot of sellers get started selling their used stuff on Amazon. You can also sell books, both used and those you write, wholesale goods, and even discounted products you can buy in department stores. Go through Amazon seller registration. Next, you’ll need to register your “business” on Amazon. Remember, by business they don’t mean that you’re a big corporation. You can sell on Amazon as an individual. List your products. Once you’re registered, you need to list your products. After that, all you have to do is wait for a sale. 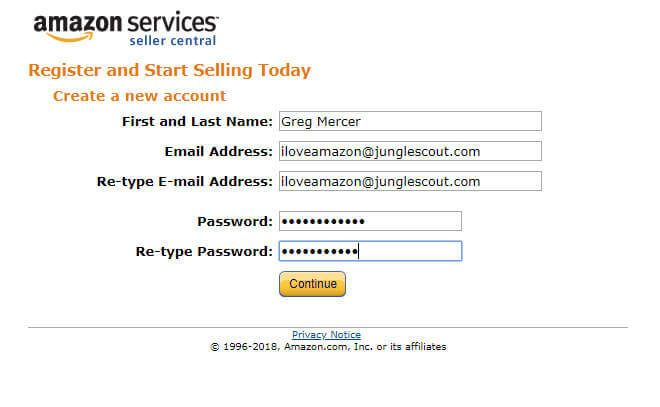 Next, I’ll show you how to go through Amazon seller registration process. How do I create a seller account on Amazon (Amazon seller registration)? 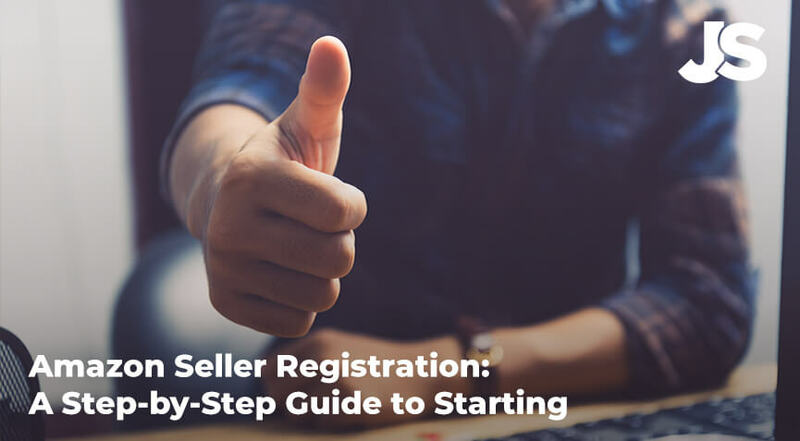 Once you’ve figured out what you plan on selling on Amazon, you’ll need to go through the Amazon seller registration process, which is really quite simple. On the left side, look for the “Selling on Amazon >” button and click it. Note: this is if you want to sell as an individual seller to avoid the $39.99 a month professional seller subscription. If you want to sell as a professional (sell more than 40 products per month), then just click the orange button at the top. 3 – Choose which kind of seller account you’d like to start with. If you’re going to sell more than 40 products per month, then sign up as a “professional.” Even if you’re doing it as a hobby and don’t consider yourself a professional, this plan will help you save money. Otherwise, select individual. You might also sell as an individual when you’re starting out, especially if you’re waiting on products to arrive or haven’t yet built up enough inventory to sell 40+ products per month. 5 – Enter your personal information and create a password. 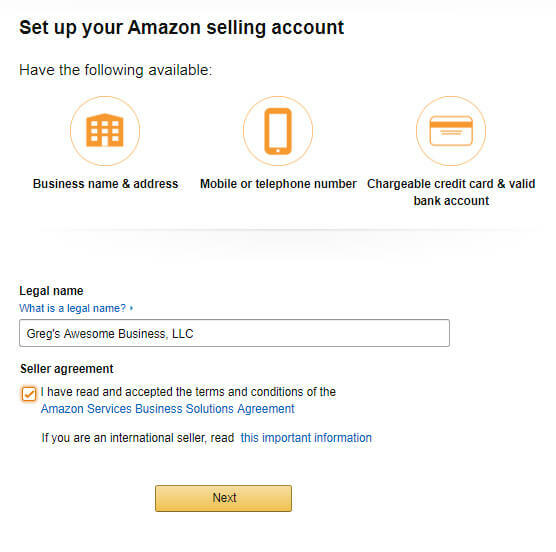 6 – Amazon seller agreement and business information. 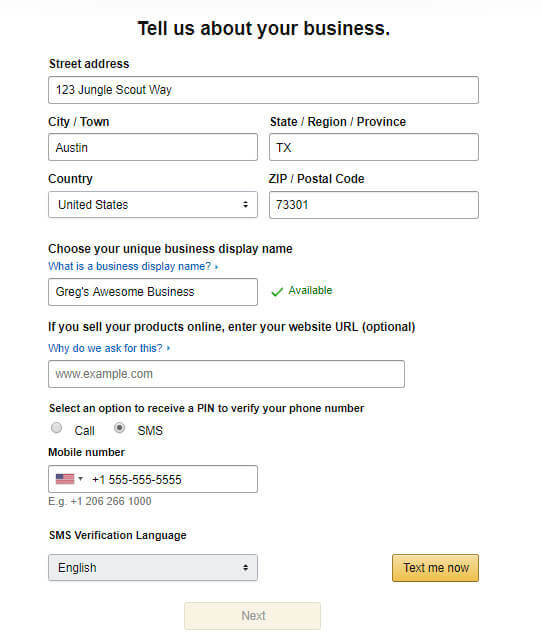 Now you’ll need to enter the name of your business and agree to Amazon’s terms of service. I’ve put LLC in the spot below, but you don’t need to have a legal business entity to sell on Amazon. If you’re registering as an individual seller, you can list it under your given name. 7 – Input your business’s information and verify that you’re not a bot. Next, you’ll need to put all of your business’s information in. Amazon will also ask for your mobile number so they can send you a text to verify that you’re a real person and not a bot. 8 – Set up your billing and deposit methods. 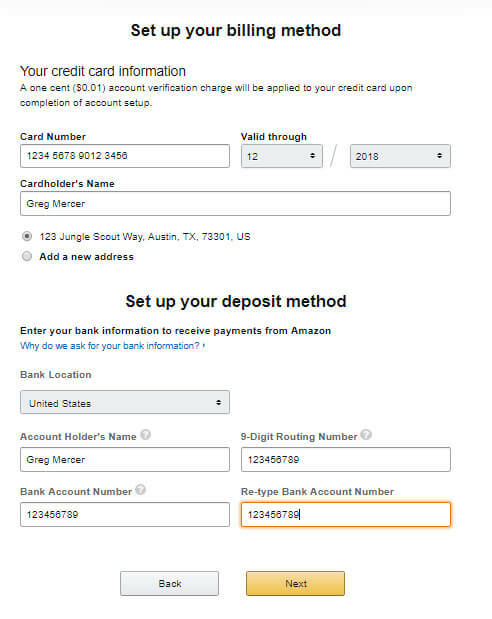 Amazon will need your credit card on file in case there’s any advertising charges or you’re registering as a professional seller. The bank account information is so they can deposit your funds once you make a sale. 9 – After that, you’re in! You may need to set up 2-step verification (to help protect your account), but once you’ve got all your ducks in row all you need to do is go to https://sellercentral.amazon.com to log in. Below is the screen that you’ll see… without any sales yet, of course. Is it free to sell on Amazon? What’s great about selling on Amazon is that you can get started selling on Amazon without spending any money at all… well, unless, of course, you’re actually buying your own inventory versus selling your used stuff that is. But to actually go through Amazon seller registration and start an account as an individual seller, you don’t have to spend a dime. However, once you make sales, there will be some fees. As nice as it would be for Amazon to allow us to use their website and services such as FBA for free, they’re still a business! However, I think you’ll I think you’ll find their fees pretty small, especially when you consider the huge number of customers that your products will be expose to. Here’s a few of the fees that Amazon adds on to your orders. Note: these fees are after the item sells, not before. Amazon referral fees. This the fee that Amazon takes as a commission for selling on their platform. It varies from category to category, but ranges between 12-40%. Most products are at 15%. Individual seller fee. This is a flat $0.99 added to each sale you make on top of the referral fee. FBA fees. If you use Amazon’s Fulfillment by Amazon program, you’ll have to cover the shipping and handling costs for Amazon. This usually works out to roughly $3.00 for small items weighing no more than a pound. The fees go up as the items get heavier or larger. Other fees. In addition to the three basic fees mentioned above, you may also have inventory storage fees (if you use Amazon FBA), media fees (if selling books, DVDs, etc), and advertising costs. Don’t let the fees scare you off. When you do the math, paying these little fees ends up being much less than creating your own site and handling your own inventory. Looking for an easy way to keep track of Amazon profits? Sometimes, the fees can be hard to calculate in advance. Fortunately, our sister site, Fetcher offers a free profit calculator to help you determine whether or not your Amazon goods are profitable. What is a Amazon professional seller account? If you plan on selling more than 40 items a month… which, trust me, is pretty easy to do with Amazon… then you’ll probably want to get an Amazon professional seller account. There’s quite a few benefits to setting up a professional seller account, like dropping the individual seller fee per item. Instead, you pay a flat $39.99 per month. What else do I need to know about Amazon? Here’s a few more Amazon selling basics that you should know about. What is the best seller ranking? Amazon organizes all of its products with a Best Seller Ranking (BSR). The more popular an item is and the more its sold, the higher the best seller ranking for the product is. Each department on Amazon has its own taxonomy of BSRs, as do the sub-categories. FBA stands for Fulfillment by Amazon. It is a service offered by Amazon where they store your inventory for you in one of their fulfillment centers. Then, when you make a sale on Amazon, Amazon’s staff (and robots!) actually pick, pack, ship, and handle customer service on your behalf. How do I sell on Amazon Prime? If you sell through the Amazon FBA program and you have enough inventory to spread around through its fulfillment network, then your product will qualify for Amazon Prime. Amazon Prime items ship 2-3 days to customers. Plus, you get the “Amazon Prime” badge on your listing, which means you’ll have a better chance of selling your product. Private label is a method of selling your own branded products on Amazon. It is, in my humble opinion, the most profitable way to make money on Amazon. Is there free training for new Amazon sellers? Absolutely. Here at Jungle Scout, we offer a ton of free information for people who are interested in selling products on Amazon. 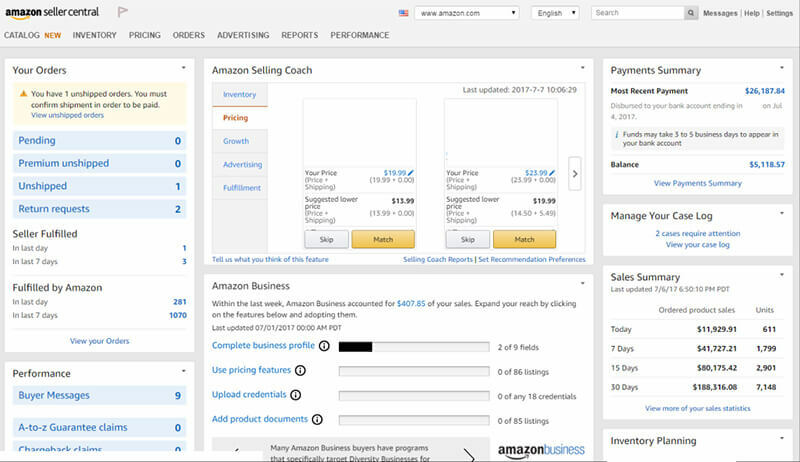 Our own Lenny Smith has a training video and article to show you how to get started with selling your own branded products on Amazon. Just click the link below. And that’s pretty much the Amazon seller registration process in a nut shell. Pretty simple, right? Hopefully you now have a pretty strong handle on how it works. Don’t forget, here at Jungle Scout we offer tons of free resources for those looking to start an Amazon business. If you have any questions or want to know a little bit more about how to start an Amazon business, please feel free to leave a comment below. Gr8, thanks ur info. That helps meh to get some info. in this field. I’m also beginner in this Amazon vast Jungle. Thanks ur info. Important question: Does Amazon accept seller if Business/LLC address is different from Credit card address? Do bank accounts/credit cards also have to be registered at the official business address? Thanks, don’t want to muck up my chances of getting approved! Hi, thanks very much for this information. I am a distributor of edible pet treats in the UK and I want to begin selling on Amazon. I will be using FBA and was hoping you have some more information on inventory management under FBA? Under FBA is it correct to say that the seller only has to ensure that the amazon warehouse is sufficiently stocked to meet customer orders and that any distribution from the warehouse is left to the amazon distribution function to deal with? How would one ensure the amazon warehouse is sufficiently stocked with inventory and how do you ensure that your stock is held at a number of distribution warehouses across the UK region. When using the Amazon fab program, does Amazon handles defective products return by customers? And, how does it work? One thing that I would not like be part of is having to deal with products cominto me or my home address. You have two options. You can either have it sent directly to you or you can have Amazon dispose of it for you. Both have an associated cost. Sometimes, though, the “defective” product is nothing more than a dinged up box. It seems you forgot a liiiiiiiittle detail, amazon now asks for a SS#! (TIN) I just tried to set up a new selling account and I found out that (even to sell a few things) they want “Tax Information”. If you are a U.S. tax payer, by completing the tax interview in your seller account, you will be providing Amazon the appropriate tax identity in the form of a W-9 or W-8BEN form. For U.S. taxpayers, a Taxpayer Identification Number (TIN) is required by the IRS for the administration of tax laws. In most cases, your TIN is either an Employer Identification Number (EIN) or a Social Security Number (SSN). My question is why do they want it now and they did not need it before (same with the credit card)? The way it is going, it would not be surprised if amazon soon will ask for a urine, stool, DNA, etc. sample (and maybe request to have a “chip” implanted to be able to sell). I looks I will be an eBay seller after all. Thank you very much for your information. Could you tell me please, Can i change my individual account into pro. after some time? Fia, Did you ever get an answer to this question regarding LLC entity name and use of personal internationally chargeable credit card? If you would please reply if you have an answer that would be amazing. Hi Dave excellent blog on Amazon thanks for all the ideas shared. The process is still the same as it would be in the US, just a smaller market overall. In my experience, it’s a little harder to profit on Amazon India as most of the items cost very few rupees. i want sales my rugs product on amazon..com so you tel me which type i do. Which type of what? Seller account? I want to provide a simple solution to distributing a family genealogical book to about 40 family members, 7 of whom live outside the US–England, Holland, Germany, Australia and Israel. There will be a charge for the cost of the book. My concern is the cost of shipping to these non-US addresses. Through any international air carrier, it can run $70-100 per location per book. Do you know if Amazon has a different shipping cost structure?-it can go by ship. I have tried to talk to an Amazon agent, but have not found any department that is willing to explain this. Thanks very much. You might ask a logistics company the easiest and most cost-effective way to do this. I’m not sure doing it through Amazon will work. DHL might have good rates for foreign carriers. Please, how if a product has a private label potential? And if there are multiple sellers for the product and how I can know if the product is patented or patent pending without going through the rigours of patent search that I don’t really understand. if you need to register VAT in Europe, do you have to have an entity? We have a comprehensive guide to VAT from our European Million Dollar Case Study that you can read through here. It should answer your questions and help you get started! Great and informative blog. I have learn a lot. 1. Which one do you recommend for a newbie when starting in amazon fba (individual or pro merchant seller)? 2. As an international seller, Is EIN required if I choose a pro merchant account? 3. As for the shipping of goods, when do you recommend to use air or sea freight (is it base on weight)? 1. Depends on how many you think you’re going to sell. If you’re going to sell 40+, go Pro. Otherwise, stick with individual. 2. That I’m not sure of. You may contact Amazon direct to see what’s necessary for your country. 3. For private label, if that’s what you’re talking about, go with whichever is cheapest haha! Sea freight isn’t tough, just requires a bit more prep. And you can outsource with a third party logistics company if you need to. Yes, I had the same issue trying to get verified ultimately being told that I may not sell on Amazon. I have a LLC in California, business bank account and credit card etc… and without a utility bill no dice. I use a managed mail service for my business location so getting a utility bill (cell doesn’t count) is impossible. The verification group is not transparent or approachable either as they assume you are a fraudulent scammer so there is no one to talk to and the responses are just templated emails with the same request. I spent a lot of time following the Jungle Scout case studies and other resources so this was was a bit upsetting and quite a let down. 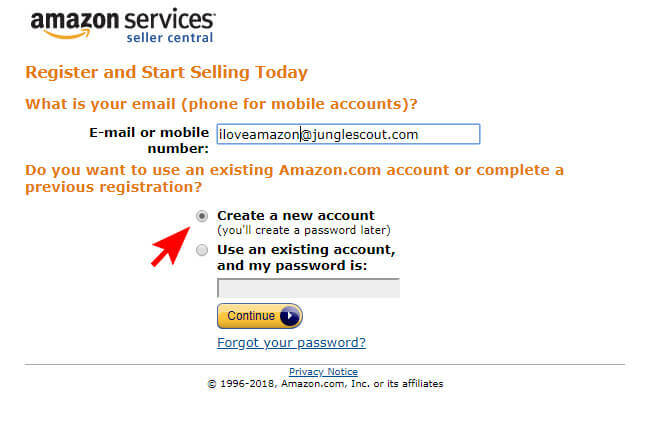 Jungle Scout is a great company with awesome resources just make sure you do a little research on the Amazon verification process beforehand so you aren’t blindsided. In particular make sure you make the correct decisions on the structuring of your business. You don’t mention anything about the verification process. This is turning out to be the biggest hassle in setting up an account. You make it look so easy here but it’s been nothing but a headache trying to get our documents verified to set up the account. I wish it was this easy!! We actually wrote a piece earlier this year on the registration process for products. For this piece, we just wanted to introduce things. But for those interested, some categories are harder than others. In my opinion, the easiest ones are Kitchen/Dining, Sports/Outdoors, and Garden. Hi. Thanks for the content. Question about the professional Amazon acct. It is stated if one wants to to sell over 40 products to opt for the pro account of $39.99 a month. Now does this mean selling 40 different products or SKU’s such as a bigger store if you will, or does this mean 40 sales in general per month of any one item (40 monthly sales in general)? Good question. It’s just a math thing. Selling individual, you’re charged an extra dollar by Amazon for every sale you make. Doesn’t matter if it’s one or many SKUs. Therefore, if you sell 40 items, you’ll get charged an extra $40 in fees. Therefore, it makes sense to sell Pro if you’re going to do more than 40 sales. Otherwise, you’ll end spending more in fees than you really need to. One thing I’m not seeing is how you know the exact address of where to ship to? How does amazon know to expect the packages? Once you create your fulfillment order through Amazon seller central, they’ll autocreate labels to send your products to. I am new seller, and my products will ship to FBA warehouse next month. trying to learn on Amazon. When click manage inventory, then click preference, there are lots of boxes we can check. would you give us idea what to do with each of them? There is also buy box price. Do you normally check it? What does it do when check it on? Hi Greg! Love this blog! Tons of info that helps…I wanted to ask in your experience, for those who do not live in the US, what do you recommend to start selling in Amazon (private label, wholesales, books)? Great question. Lots of sellers come from different backgrounds. Greg started with wholesaling and I started with books. A lot of folks just start with private label. And even more try out arbitrage first. It really comes down to what you feel most comfortable with and what works with your budget.